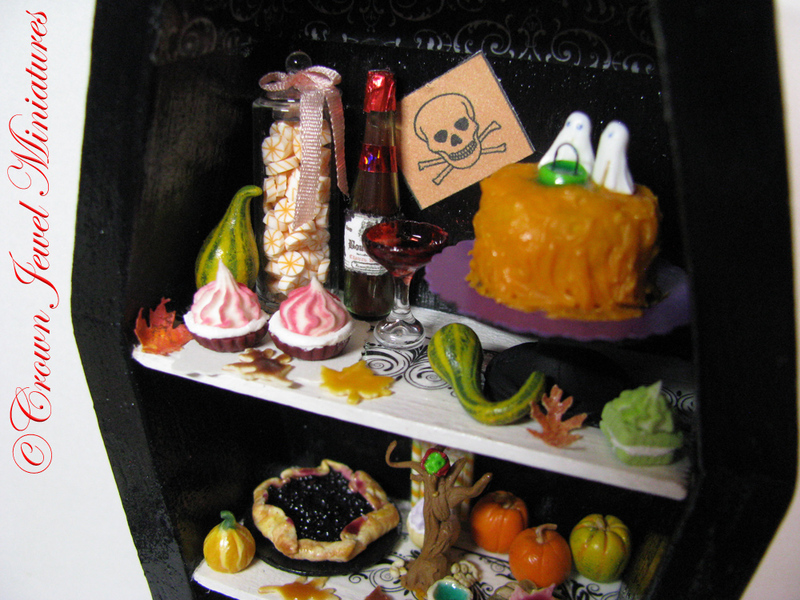 Dracula’s Pastry Cupboard© is the eighth in the series, as shown in Issue #68 of Artisans In Miniature. This is a one of a kind and is now available via my Etsy shop just in time for the Halloween holiday. It will not be reproduced, so grab it while you can! Count Dracula has benefited greatly from the new tax cuts and decided to splurge on a new coffin, but what’s a vampire to do with the old one? 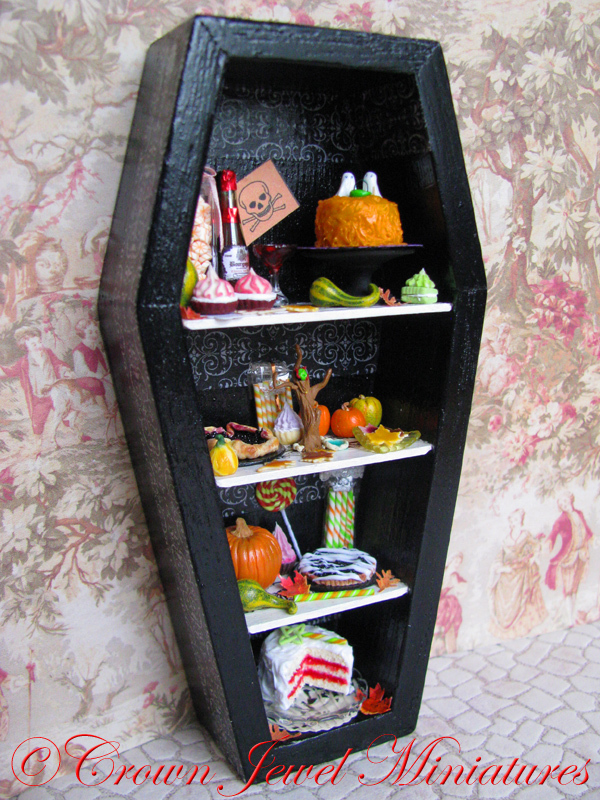 Inspired by the 2011 edition in the series, Chef Ina Coffin©, I helped our favorite Count repurpose another coffin in a macabre bakery fixture and now he is eager to sink his famous fangs into the blood orange filled layer cake. Who knew Count Dracula had a sweet tooth? Drac moved his pillow and cloak to his new casket, but as you can see he insisted on leaving his favorite “poison” sign inside this one. I tried to explain it wasn’t appropriate for a display of baked goods, but he gave me that hungry stare that sent a chill up my spine, so I left it in and further humored him by giving it a fresh coat of paint and black and white decorative accents to show off his style. 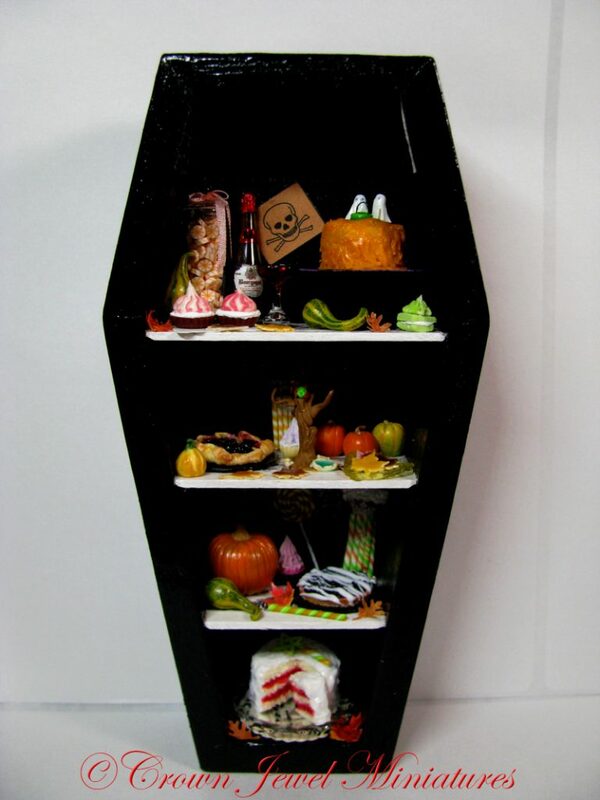 Top to bottom, the shelves are crammed with everything your mini ghoul will need for a well stocked candy cupboard or sinister display in your dollhouse bakery. The top shelf has an orange frosted cake topped with fondant ghosts stirring a green apple cauldron filled with blue raspberry syrup. 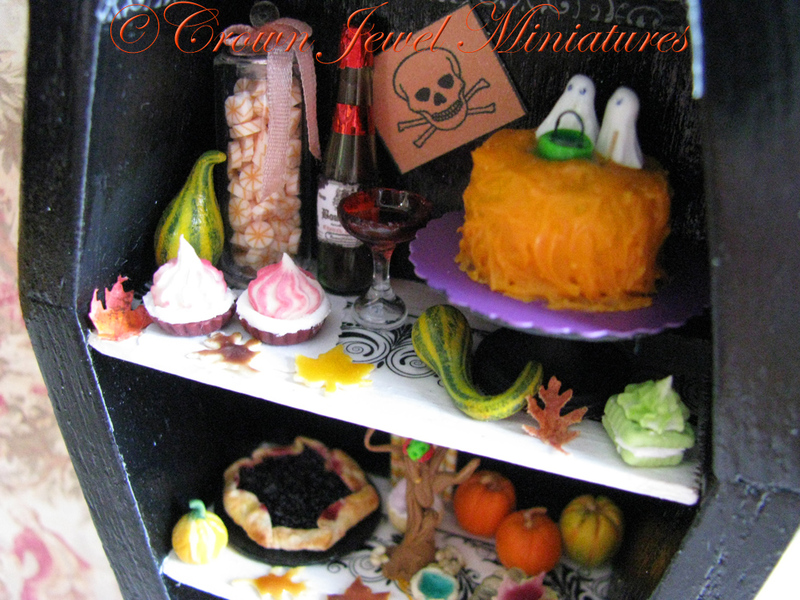 The Count’s favorite vintage of plasma wine and crimson cup wine glass are nestled close to a tall jar of orange and cream candies, red velvet tarts with cherry vanilla whipped cream, maple & oak leaf glazed sugar cookies, a lime wafer sandwich cookie, 2 gourds and autumn leaves. 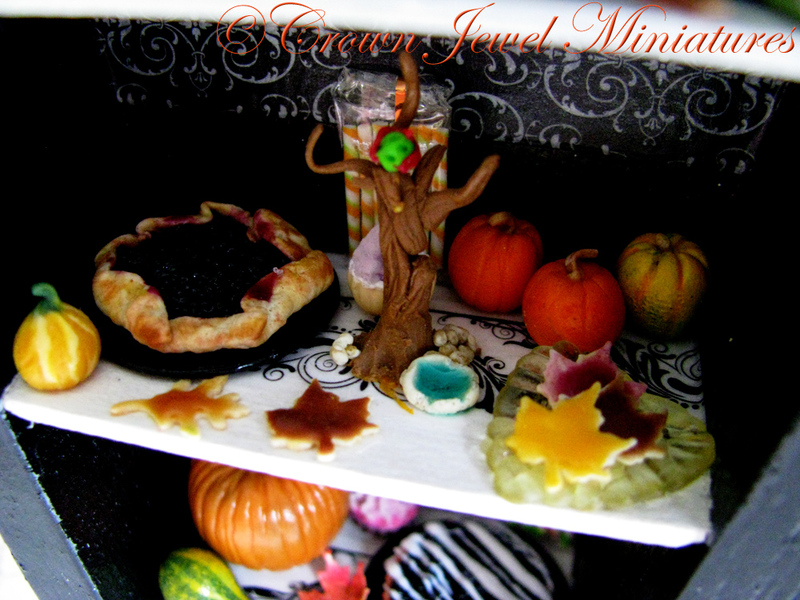 The second shelf serves a leaf shaped plate with more maple glazed sugar cookies, 2 very tiny pumpkins, a carnival gourd, a package of citrus candy sticks, a vanilla cupcake with blueberry whipped cream, a tiny squash gourd, a blackberry galette on a black plate, maple & oak leaf cookies and a chocolate sculpture of a haunted tree complete with a goblin head, candy rocks near the base and a blue raspberry filled cookie. 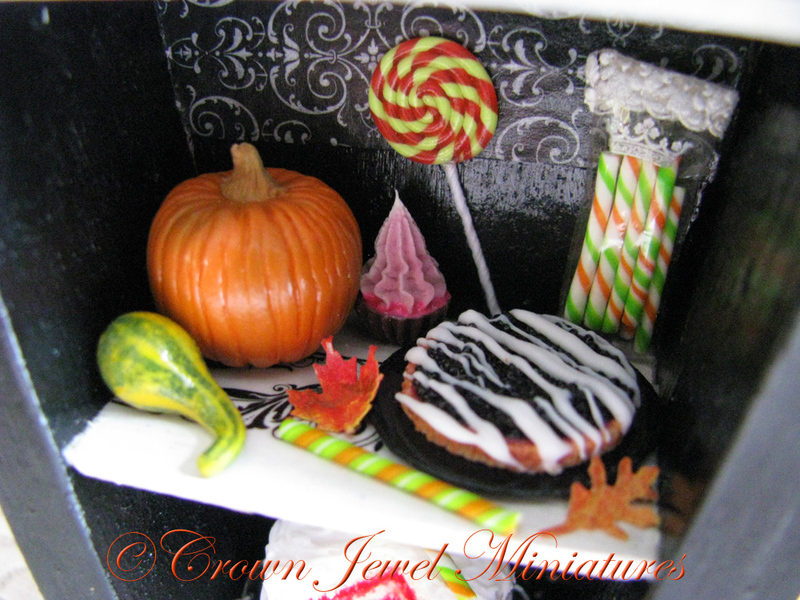 Shelf three offers a twisted lollipop, chocolate cupcake with tall raspberry whipped cream, a sugar pumpkin, bag of lime candy sticks, citrus candy stick, 2 gourds, fall leaves and an iced blackberry tart on a black plate. On the bottom shelf we have the Count’s favorite blood orange jelly cake. As you can see, he couldn’t wait to bite into a few slices, but don’t despair… I’m sending you one loose slice to display as you wish. Served on a ruffled glass cake plate, this vanilla layer cake with blood orange filling, vanilla frosting is topped with a festive candy stick and a lime chocolate decoration. Two additional autumn leaves complete the scene. He prefers to dine solo, and legend has it he can be a real pain in the neck with unexpected visitors. This entry was posted in Announcements, New Miniature Art! 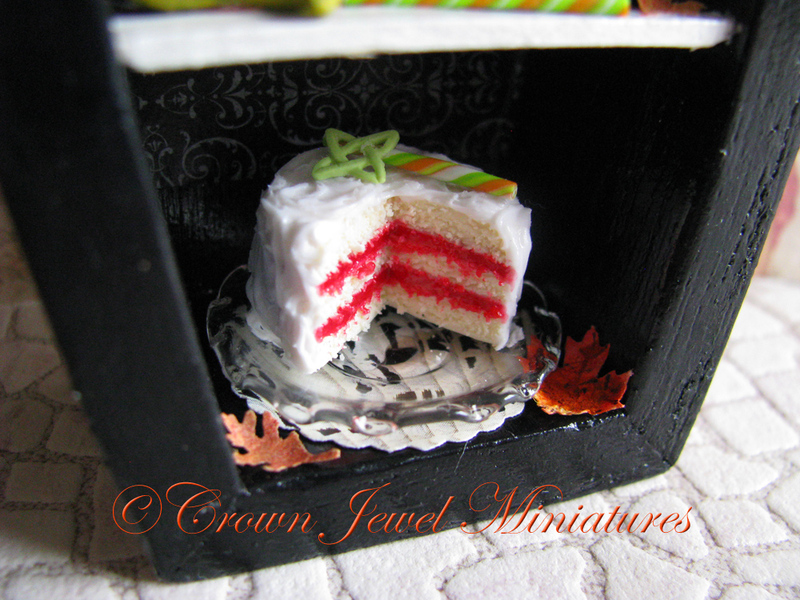 and tagged bakery, cake, candy, Coffin, Crown Jewel Miniatures, cupboard, Dollhouse, Dracula, Halloween, IGMA Artisan, Miniatures, Trick or treat, Wine. Bookmark the permalink.